While my go-to breakfast through the week is a smoothie, my favourite breakfast creation over the weekend typically involves eggs. I also love eggs immediately following a workout (as they are an awesome source of protein and good fats), and I love hosting brunch in-home with any of the following favourites — they are all approved on the Maximized Living Advanced Nutrition Plan (except for a few which use sweet potato and quinoa … which would be my version of “cheating” while hosting guests for brunch!). Remember that, unfortunately, free-range chickens are not all they are cracked up to be. As long as these chickens have “access” to the outdoors (even if a door is open only 5 minutes per day), they can be classified as free-range. Cage-free chickens aren’t necessarily roaming the farm, either — they are often packed in coops with hundreds of other chickens — just no individual cages. In both cases, these animals may be fed poorly, given antibiotics, be vaccinated, and inhumanely debeaked. My best recommendation for you is to KNOW your farmer. Thoroughly understand the source of your eggs and how the chickens are cared for. This shouldn’t be difficult to learn when you source your eggs at a local farmer’s market, health food store, or even better, on the farm itself! 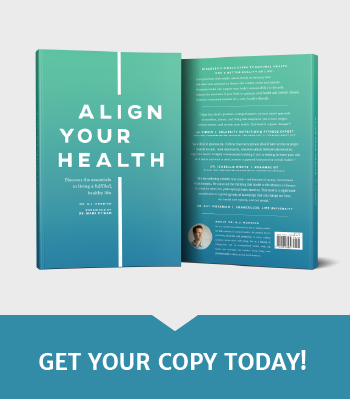 Once you do identify those ideal organic eggs, they’ll fill you up with tons of selenium, vitamin B2, choline for your brain, and incredible antioxidants like zeaxanthin and lutein which benefit the eyes. 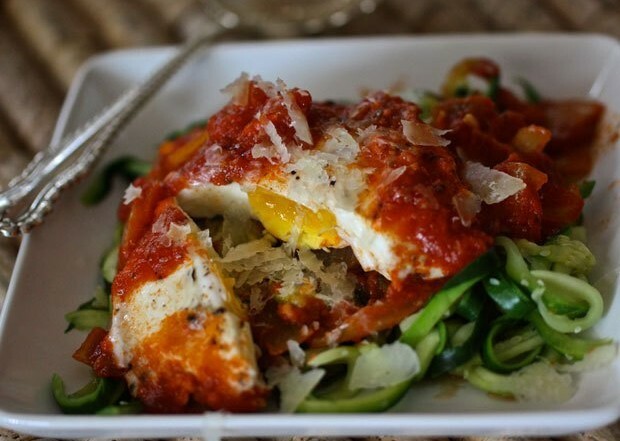 Eat those yolks, preferably uncooked, as they contain great healthy fats that your body needs. This protein-packed, gluten-free crepe makes a great go-to wrap for everything from breakfast to dinner to dessert. Click here for the Olive Oil–Fried Egg and Smashed Avocado recipe. Prepare your ingredients ahead of time, so you’ll have this healthy option quickly made in 6-7 minutes. 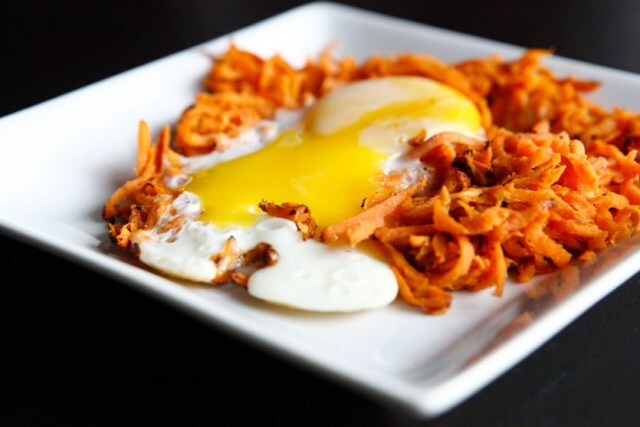 Click here for the Paleo Sweet Potato Hash with Sunny Side Up Egg recipe. Eating the same old eggs everyday can get dull. If you are a fan of spice, this Indian-style scrambled eggs masala recipe is worth a try. Click here for the Scrambled Eggs Malasa recipe. 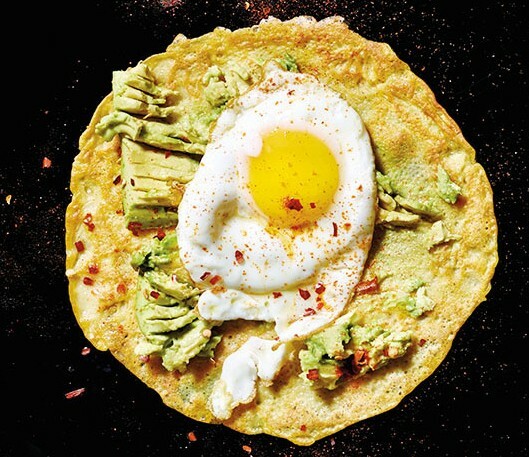 Add a little burst of Spring with this fortifying breakfast recipe, so you maintain a low-carb, high-protein, healthy and clean diet. 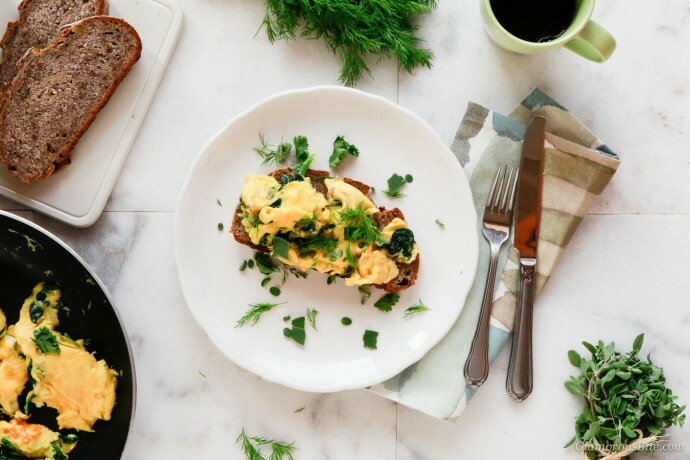 Click here for the Paleo Scrambled Eggs with Herbs recipe. 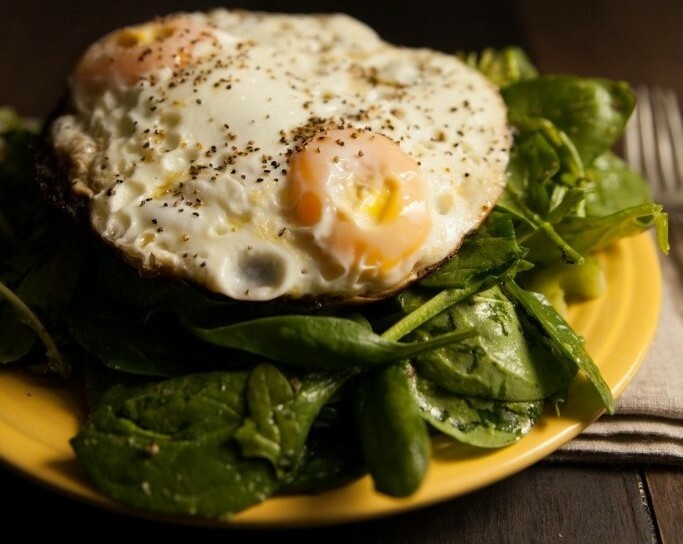 Toss your favourite greens together in a salad and top them off with the easiest protein source – eggs. Click here for the Breakfast Salad with Eggs Over Easy recipe. 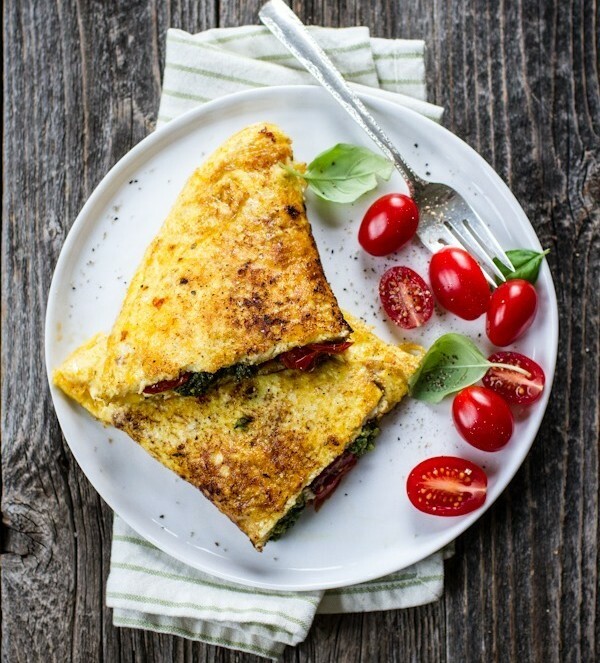 Savour your morning with the creamy texture of pesto and tasty pan-roasted grape tomatoes in this spectacular omelet. Click here for the Pesto + Roasted Tomato Omelette recipe. This recipe is quick to make for lunch or dinner, so you don’t have to spend hours over the stove. 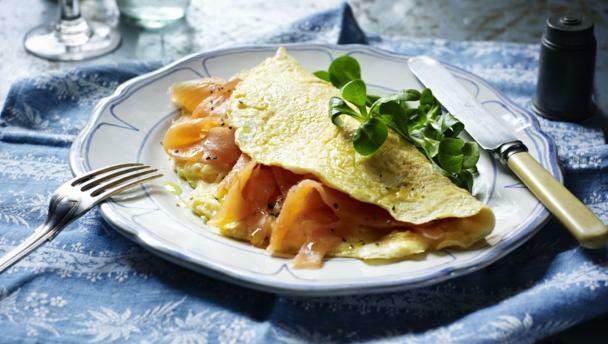 Click here for the Smoked Salmon Omelette recipe. Juicy blueberries add sweetness and lemon adds a zing to this classic dish without turning it into a dessert. 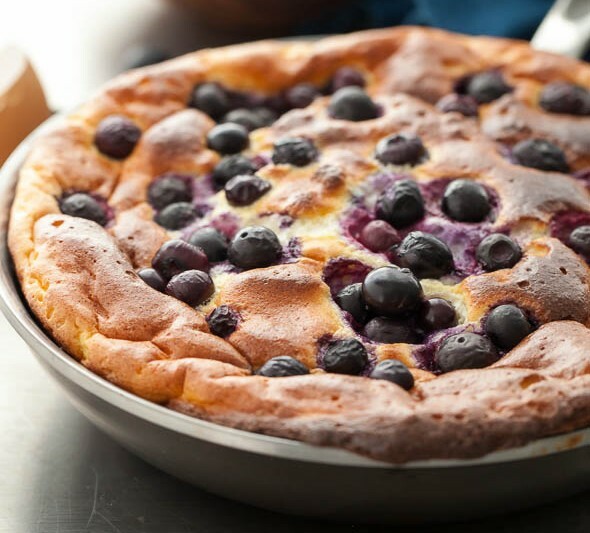 Click here for the Sweet Blueberry Lemon Puffed Omelette recipe. Forgo bread with a crisp slice of Granny Smith apple that will contrast with the flavours of salty smoked salmon and fluffy eggs. 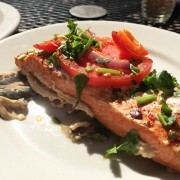 Makes a creative main course for a garden party too. 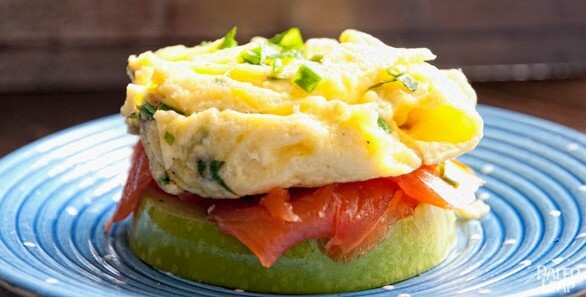 Click here for the Egg, Salmon and Apple Sandwich recipe. Marinating eggs in this tea mixture creates a savoury taste and marbling/spider web effect that looks like art. 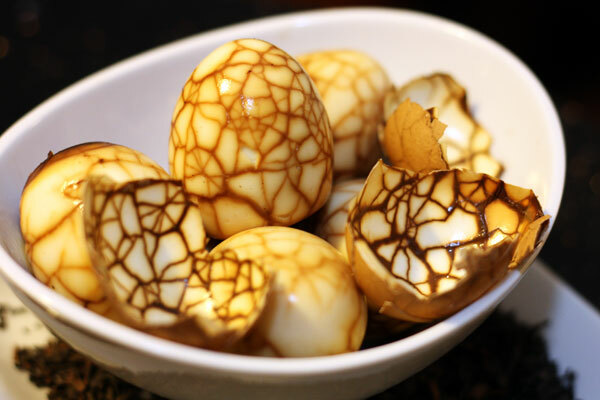 Click here for the Chinese Tea Eggs recipe. You’ll stay satisfied from breakfast until lunch with this simple dish full of protein and fiber. 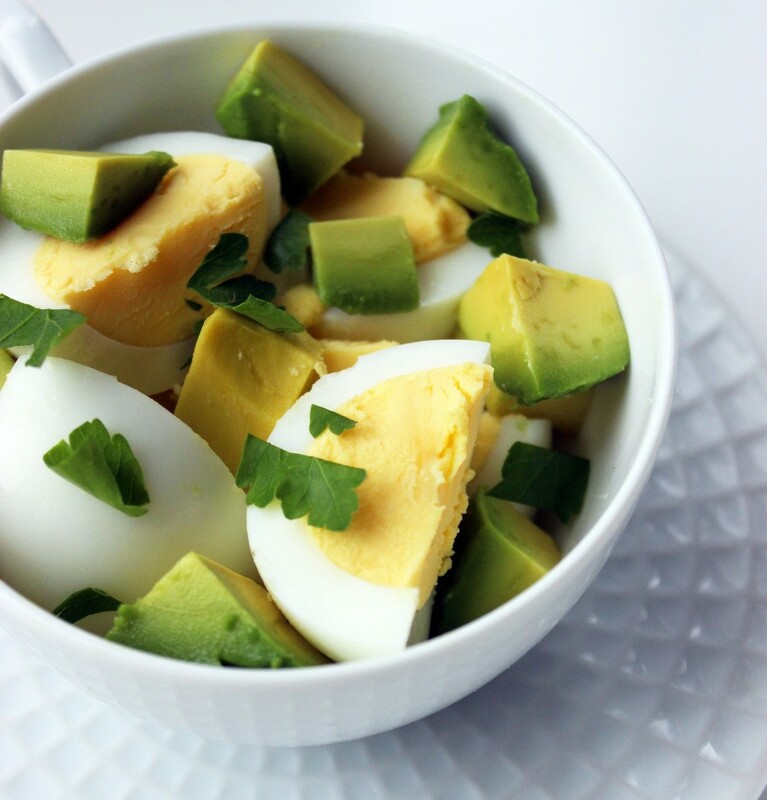 Click here for the Avocado and Egg Breakfast recipe. Try this healthy twist on the classic eggs benedict with sunny side up eggs and a hollandaise sauce that is not your standard recipe. 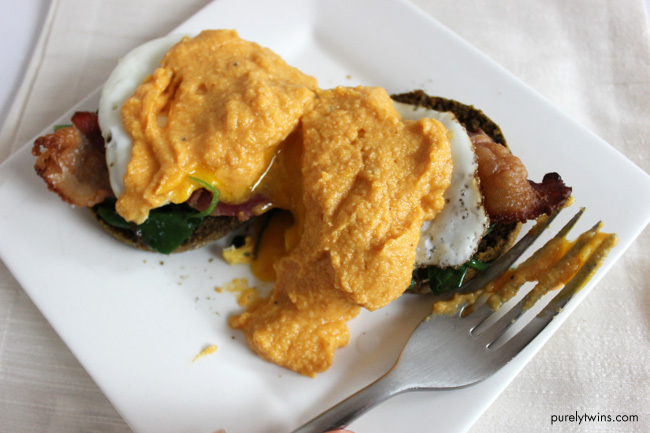 Click here for the Pumpkin Eggs Benedict with Homemade Pumpkin Hollandaise Sauce recipe. This healthy and versatile dish pronounced as Shock-SHOE-kuh could be made for breakfast, lunch, or dinner. Click here for the Simple Shakshuka recipe. Take this beautiful, delicious and easy to make appetizer to your next spring party. Put your own twist on the recipe by varying additions, spices and seasonings. 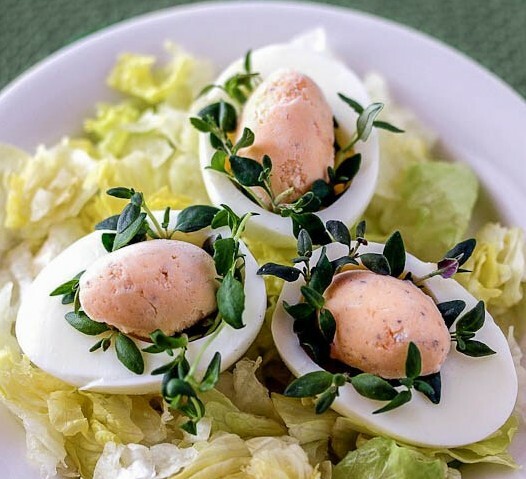 Click here for the Deviled Eggs (Nests) recipe. Make a classic sandwich with this simple egg salad and your favourite, healthy bread option – try Maximized Grainless Rolls, Dark Rye Bread or Coconut Flour Bread. 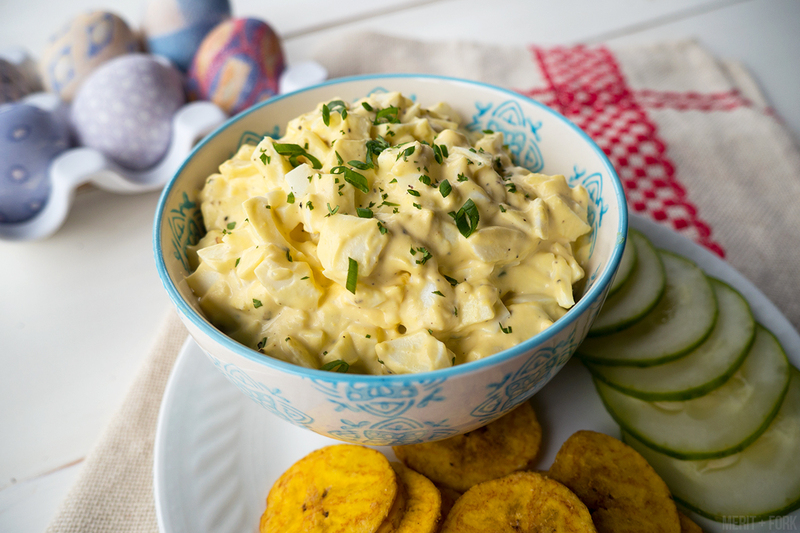 Click here for the Classic 5-Ingredient Egg Salad recipe. This recipe takes a bit of patience to get the perfect effect with the eggs, but worth the effort. 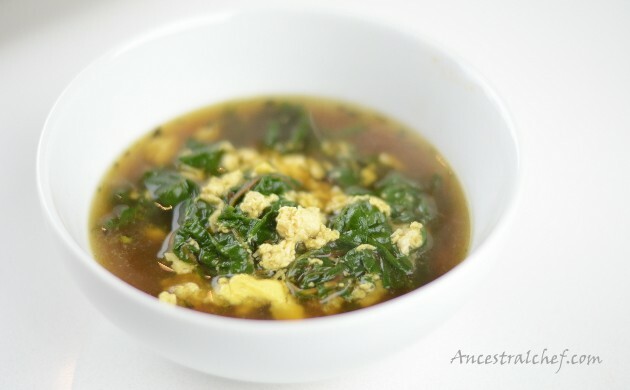 Click here for the Simple Egg Drop Soup recipe. Gyeran jjim meaning “steamed eggs” set into a custard with the texture of silken tofu that compliments steamed rice very well. Simply change the fillings and toppings as desired like you would with an omelette. 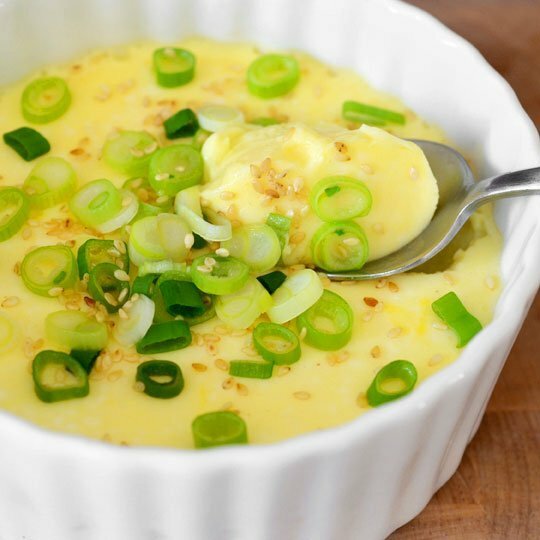 Click here for Korean-Style Steamed Eggs recipe. This recipe is as clean eating as you can get, loaded with nutritious benefits and colourful too. 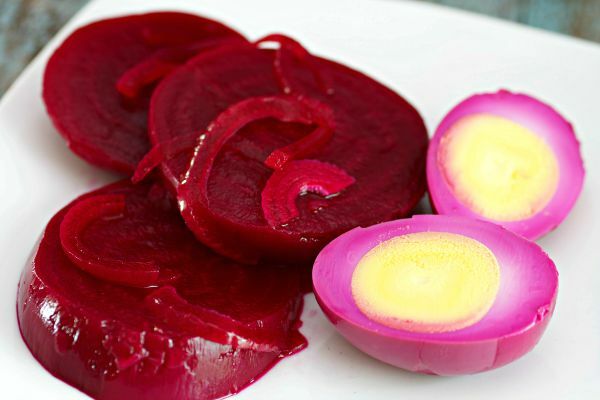 Click here for the Paleo Pickled Eggs with Fresh Beets recipe. 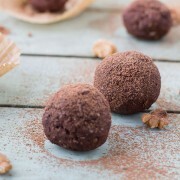 What could better than a recipe of protein wrapped in protein? 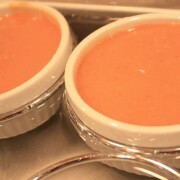 Only mixing up this warm or cold recipe with a bunch of different flavours and combinations. 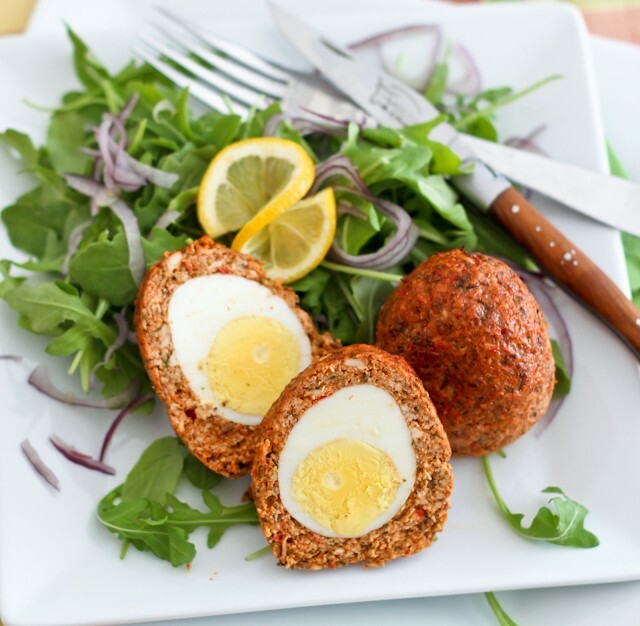 Click here for the Paleo Chicken Scotch Eggs recipe. This dairy-free, nut-free and Specific Carbohydrate Diet (SCD) will help you stick to your eating right goals. 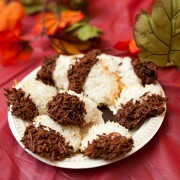 Click here for the Easy Egg Nests recipe. 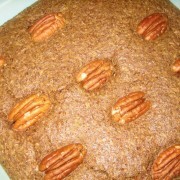 This fun recipe can be made ahead of time as it will keep in your fridge for a couple of days. 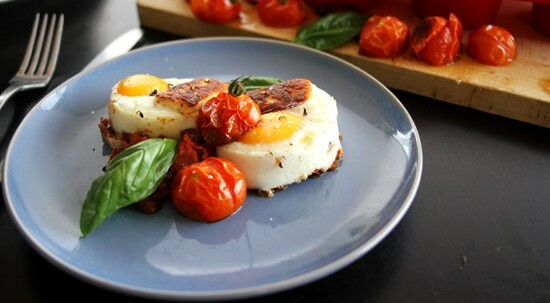 Click here for the Baked Eggs with Haloumi & Tomato Sofrito recipe. Fresh salsa is a perfect contrast to the richness of a baked avocado egg, so mix up the flavours with Fire Roasted Salsa, Best-Ever Salsa or Award Winning Salsa. 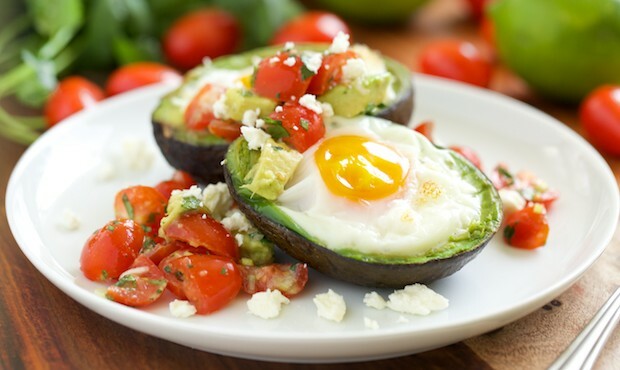 Click here for the Mexican Baked Avocado Eggs recipe. 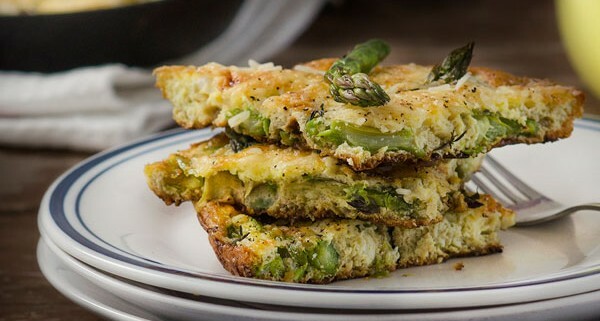 Instead of a classic egg-in-a-hole breakfast using bread, try this healthier version with squash and top it with your favourite salsa, guacamole, hot sauce, and/or cheese. 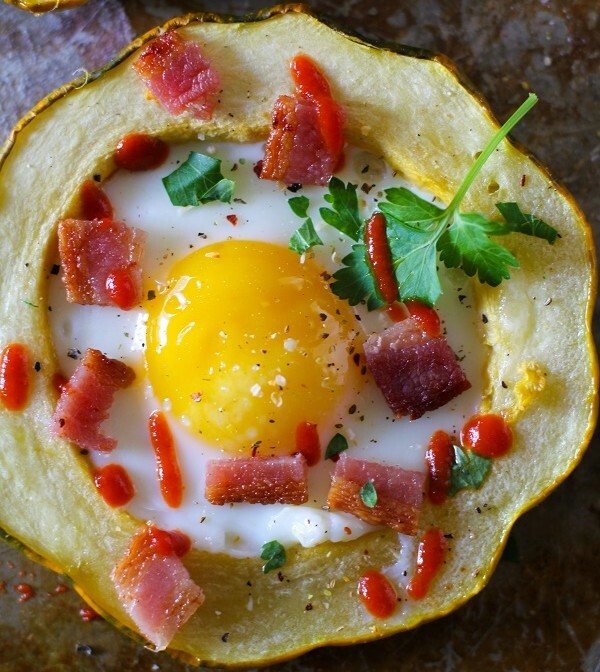 Click here for the Acorn Squash Egg-in-the-Hole recipe. Tomatoes become richer in the antioxidant lycopene when they are cooked, and their flavour blends well with eggs and this no-nut pesto. 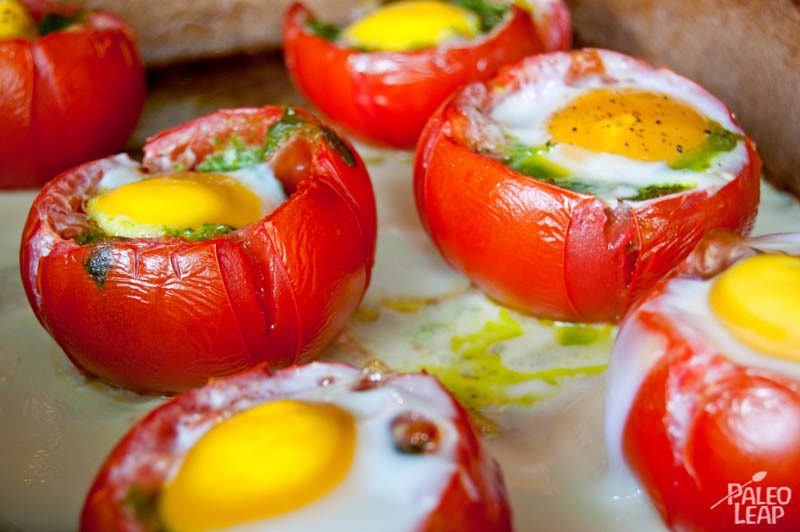 Click here for the Egg and Pesto Stuffed Tomatoes recipe. Make the most important meal of the day more colourful, delicious and nutritious with this quick and easy side dish. 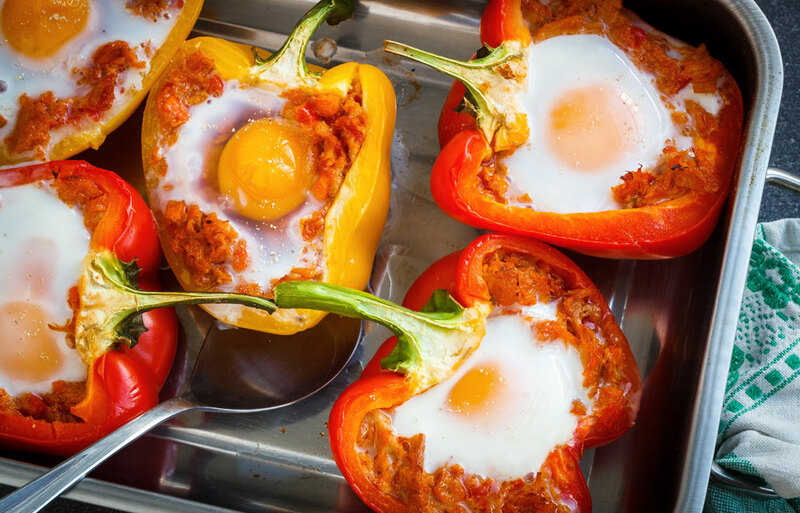 Click here for the Breakfast Stuffed Peppers recipe. 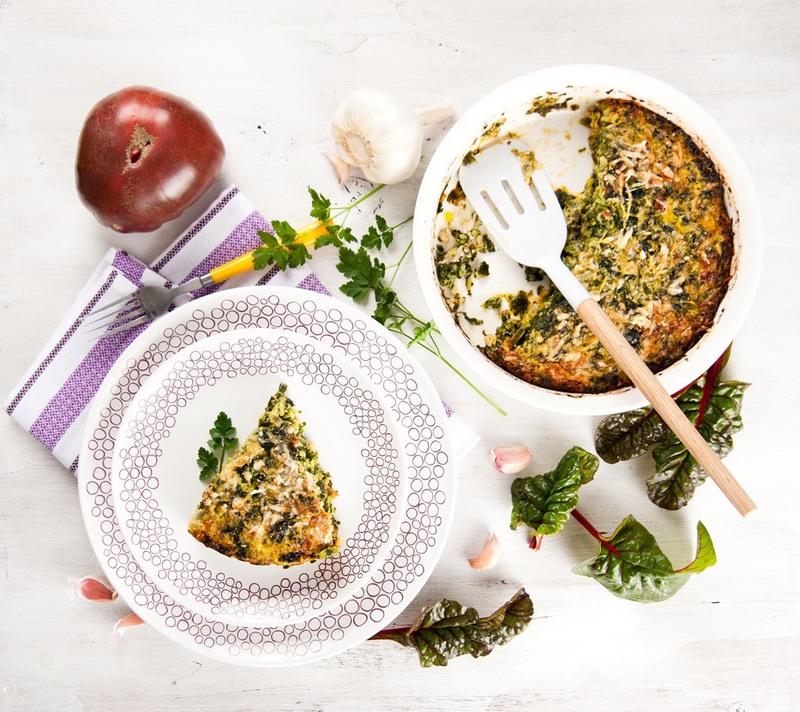 Quiches are a breakfast/brunch classic that you can switch up with different vegetable and organic meat proteins. 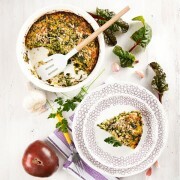 Click here for the Crustless Quiche recipe. 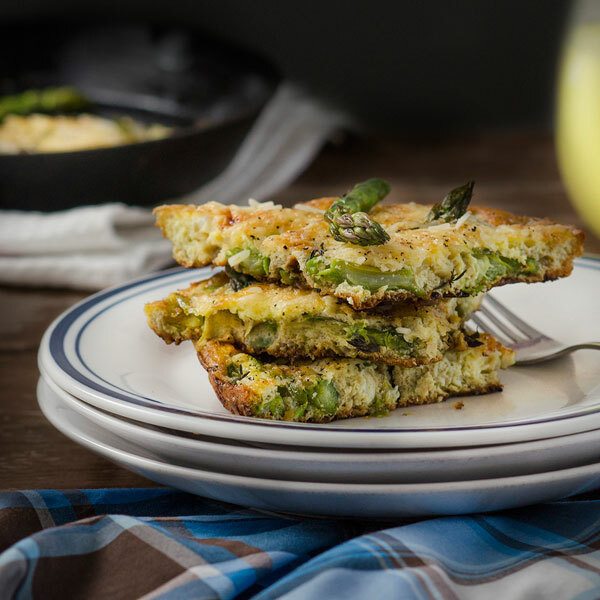 Start your day in a perfect way with extra veggies in this on-the-go breakfast or snack! 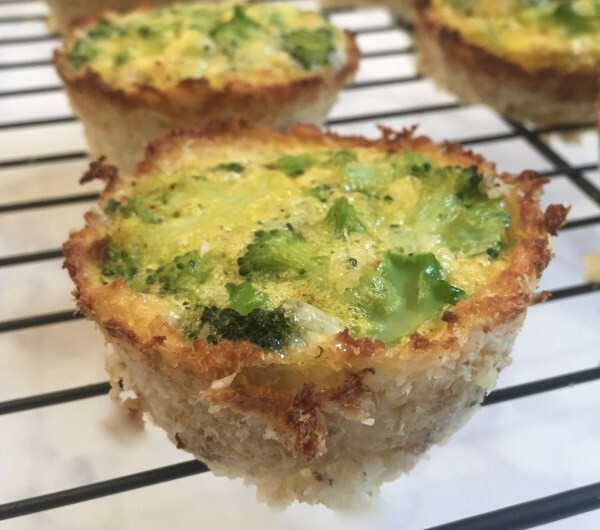 Click here for the Mini Broccoli and Cheddar Quiches with Cauliflower Crusts recipe. You won’t skip breakfast again with this recipe by making this nutrient dense breakfast ahead of time. Ingredients: coconut oil, onion, broccoli, kale, french bread cubes (gluten free), cooked quinoa, cheddar or Daiya, goat cheese, sun dried tomatoes, eggs, milk of choice, sea salt, black pepper. 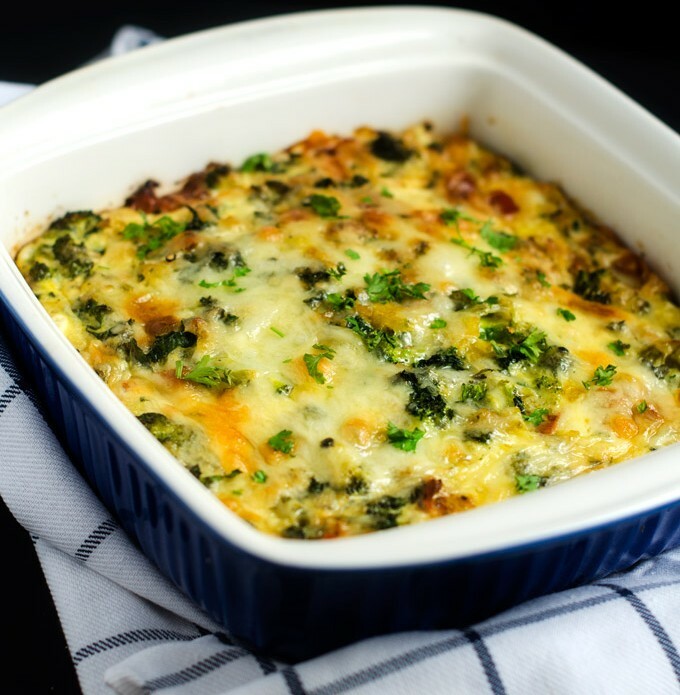 Click here for the Broccoli, Kale & Sun Dried Tomato Quinoa Breakfast Casserole recipe. 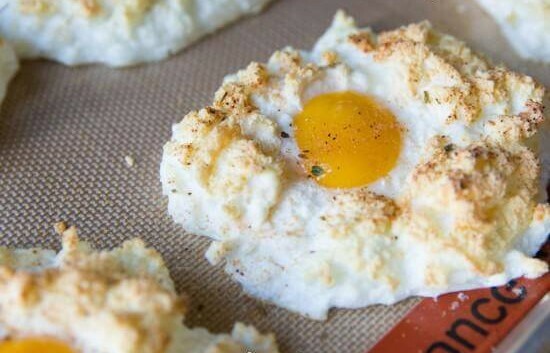 These egg muffins taste a little like a bun-less Egg McMuffins, and make a great snack for the work week. 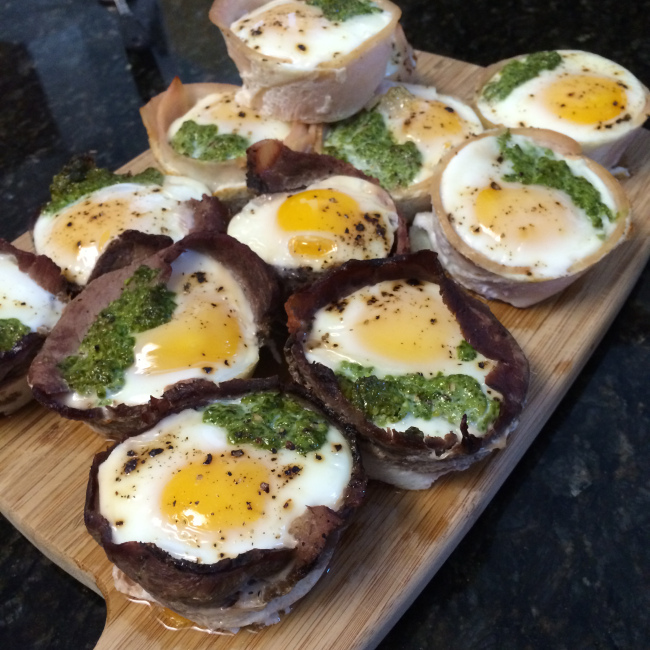 Click here for the Easy Pesto, Turkey, Roast Beef & Smoked Salmon Egg Muffins recipe. Everyone will enjoy the beauty of this frittata as your brunch centrepiece, and its delectable savory taste. 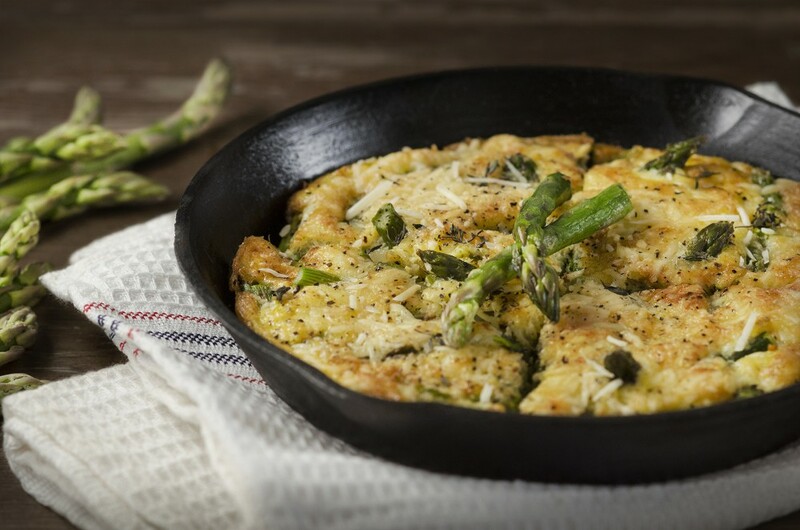 Click here for the Asparagus Frittata recipe. Jazz up a classic one-skillet meal with high quality, ground meat and experiment with different types of veggies too. 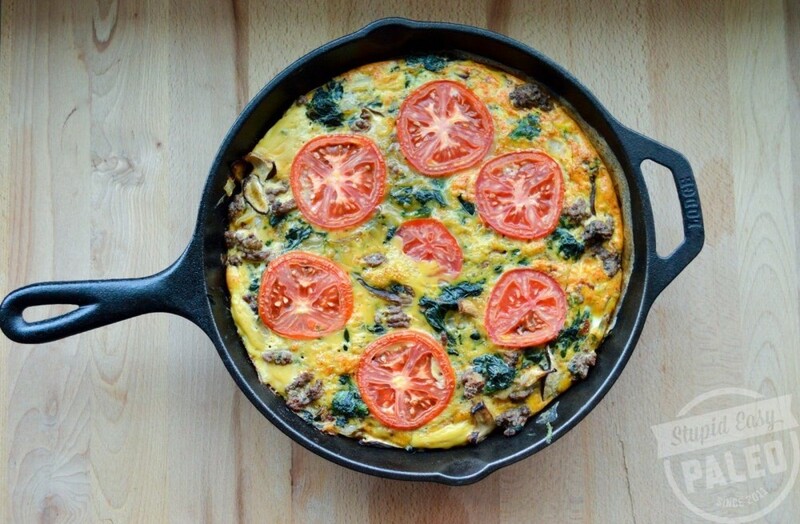 Click here for the Hearty Spinach Beef Frittata recipe. 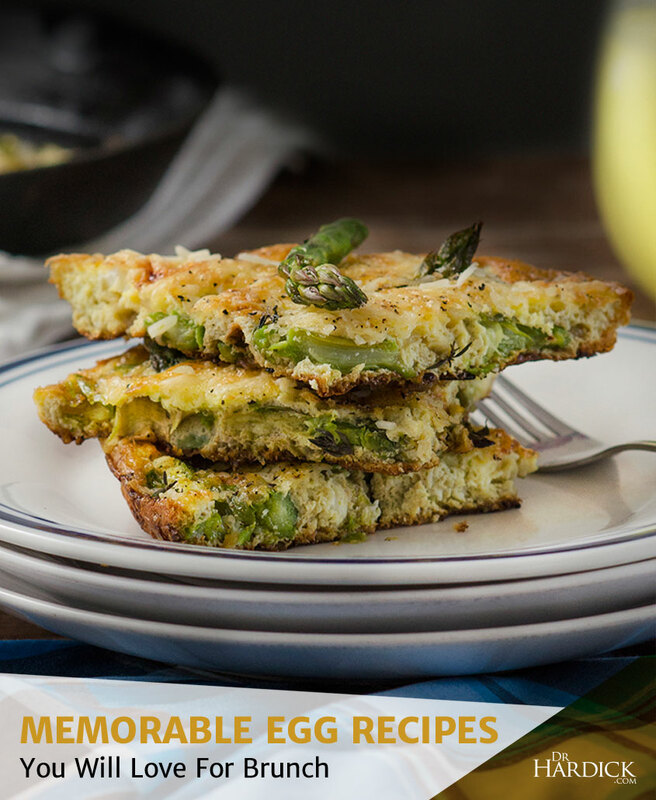 This protein packed dish is a delicious and easy way to mix up your daily egg routine. 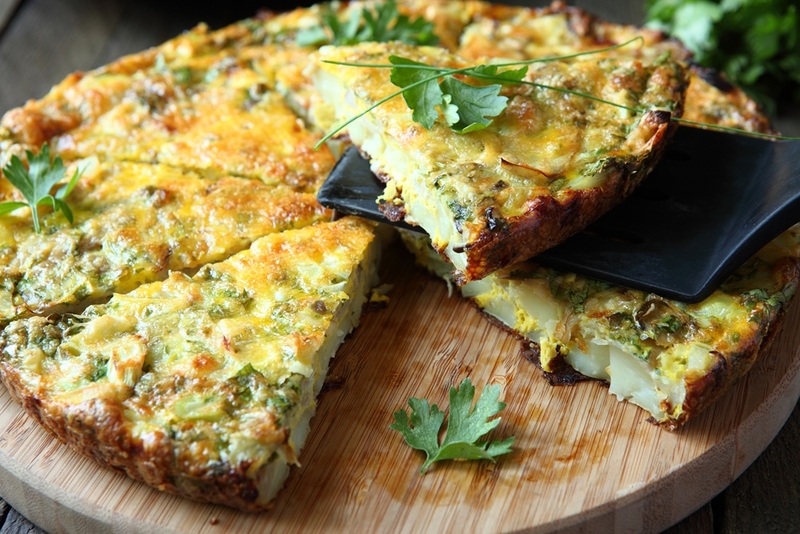 Click here for the Coconut Milk And Curry Frittata recipe. This tasty, pastry-free torte will make a great addition to your next picnic or potluck. 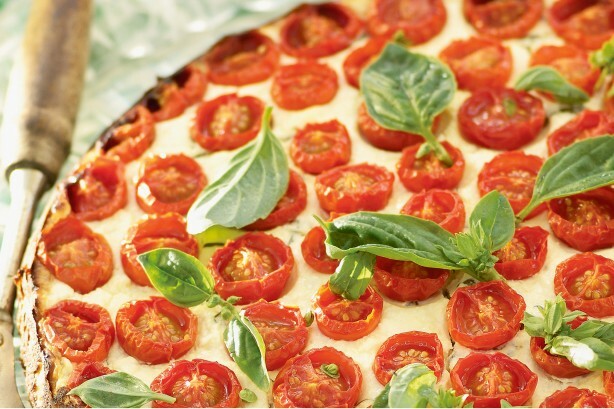 Click here for the Ricotta, Tomato & Basil Torte recipe. Customize this versatile base with any kind of spice such as chili powder, meat such as turkey bacon, or vegetables such as spinach, sweet potato or tomatoes. 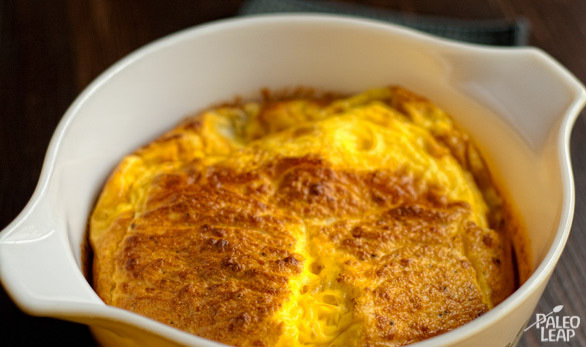 Click here for the Simple Egg Souffle recipe. 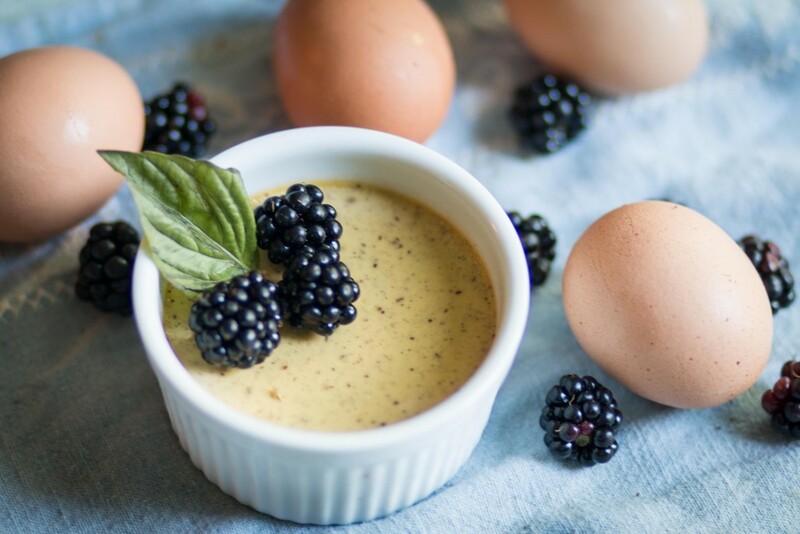 Fix your sweet tooth with this paleo custard recipe, and modify it to your taste for spicy or sweet, or make it sugar-free when you replace the honey with stevia. Click here for the Creamy Coconut Milk Paleo Custard recipe. 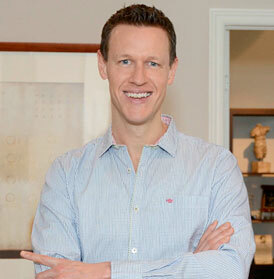 Do you have an awesome egg recipe you’d like me to try, or, better yet, feature on my site? 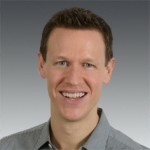 Toss me that recipe on Twitter @DrHardick … I’d love to try it!